Though Stanford’s music is still sadly neglected in the concert hall – in contrast to his church music which remains firmly established in the liturgical repertoire – his output is reasonably well represented on disc. It’s possible to acquire recordings of most of his significant orchestral music, for example. Hyperion in particular recorded quite a bit of his chamber music, albeit those recordings were made, as I recall, quite a few years ago now. I was mildly surprised to discover, however, that only the first two of his string quartets have been recorded – by the Vanbrugh Quartet (review ~ also released as Helios CDH55459). Now SOMM Records and the Dante Quartet are going to plug this sizeable gap in the Stanford discography with a complete cycle of the string quartets. This is the first instalment. There are eight quartets in all, composed between 1891 and 1919. Stanford published only the first three and the fifth. For information on these quartets, both of which were new to me, I’m indebted to the excellent notes by the expert on Stanford (and Parry), Jeremy Dibble. He tells us that the great violinist, Joseph Joachim was a very longstanding friend of and influence upon Stanford. Joachim died in August 1907. The Fifth Quartet was written in November of that year and dedicated to Joachim’s memory. Stanford personalised the tribute by including a short motto phrase in each movement. That motto is the opening violin phrase from Joachim’s little Romance. Fittingly, the piece is included on the disc though had I been planning the programme I think I might have placed the Joachim before the Fifth Quartet rather than after it so that the listener gets to hear the theme in its original context. You can programme your player to achieve that if you so wish. In a slightly unusual gesture Stanford makes his listener wait quite some time before hearing the motto. It doesn’t appear until the coda of the first movement (at 8:08) and similarly its appearances are reserved for the codas of the succeeding movements, apart from the finale in which it plays a larger role. Though the Fifth Quartet was written in Joachim’s memory it is not, for the most part, a mournful work. The first movement is outgoing and energetic, the mood positive. The music seems to me to be expertly argued. The second movement is an Intermezzo – the example of Brahms is instructive – and the marking is Allegretto (sempre molto teneramente). Much of the music is relaxed and elegant. Before we hear the other Stanford quartet the leader of the Dante Quartet, Krysia Osostowicz plays the Joachim Romance for which she’s joined by pianist Mark Bebbington, This is one of Joachim’s Drei Stücke für Violine und Klavier, composed around 1850. It’s a modestly charming vignette, which is nicely played here. The Eighth Quartet was composed in 1919 but was probably unheard in Stanford’s lifetime. It had to wait until 1968 for its first broadcast, Jeremy Dibble tells us. He’s also traced another performance that same year; how many more have there been, I wonder? It’s a serious work and one which is clearly the product of a composer experienced in the genre. Jeremy Dibble describes the first movement as “a restless, introspective essay”. It’s certainly that but notwithstanding the restlessness the music still sings. The major-key second subject is delightful. I enjoyed the movement, which is splendidly played. There follows a charming Allegretto which features some pleasing interplay between the instruments. Though much of the movement is, as I say, charming, the centre of the movement is more forthright. The slow movement is marked Canzona – Adagio. The opening is solemn and we hear a violin melody which ranges over a very wide span. The first violin and cello are the particular recipients of long cantabile lines as the movement unfolds. I found the music very moving and it is given a very touching and expressive performance. The whole thing is lovely, not least the subdued ending. Where has this music been all these years? The finale is in Stanford’s Irish vein; much of the movement is high-spirited and jig-like. However, the coda (6:38) returns us to the restless mood and what Jeremy Dibble refers to as “the uneasy shadows” of the first movement. 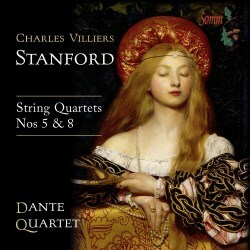 Despite this Stanford ends in the major; the conclusion to his career as a composer of string quartets is beautiful but wistful. There are two very fine quartets on this disc and if the remainder of the series contains music of similar quality then we’re in for a treat. I’ve been very impressed by this music and similarly impressed by the fine advocacy which it receives from the Dante Quartet. SOMM have recorded them in very pleasing, clear sound. Jeremy Dibble’s notes give an authoritative introduction to unfamiliar music. I look forward to the next instalment of what seems likely to be an important series, auspiciously launched here.